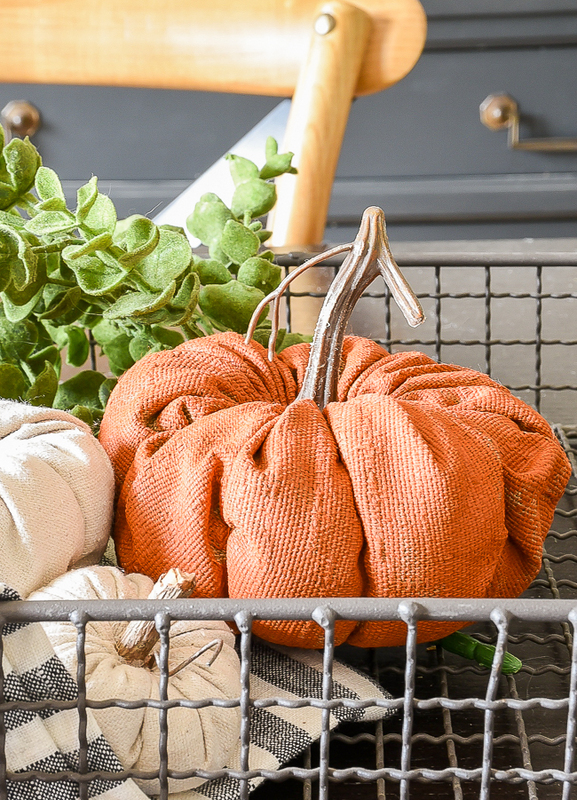 Learn how to make quick, easy and adorable DIY fabric pumpkins for fall! 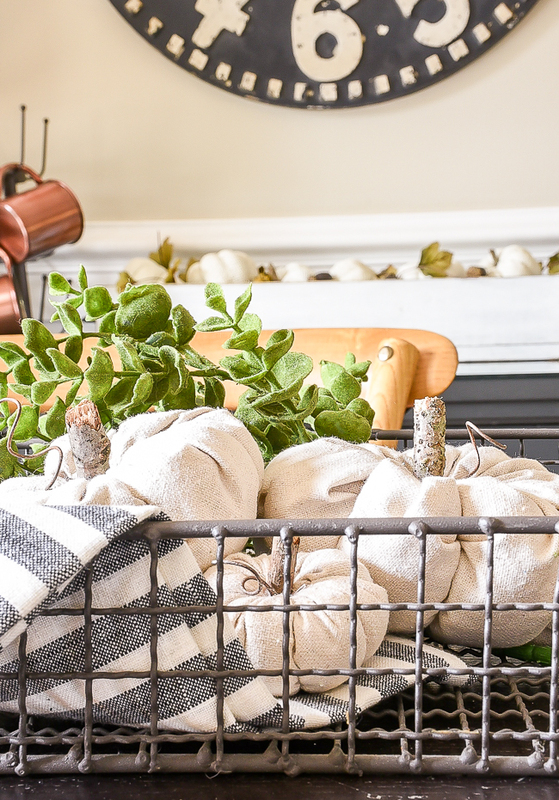 Are you looking for a quick and easy fall project? 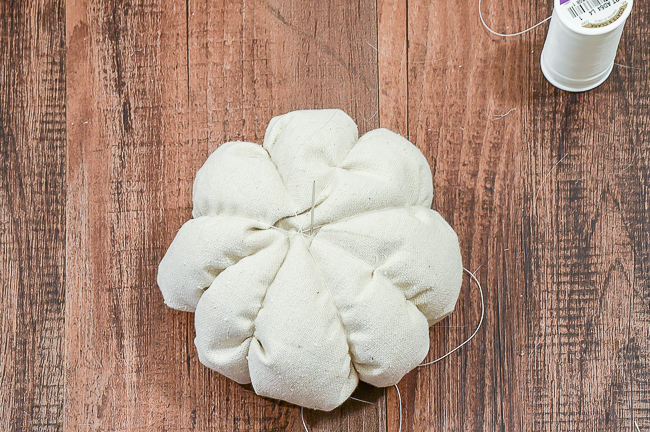 Have you always wanted to learn how to make fabric pumpkins? Well, you're in luck! 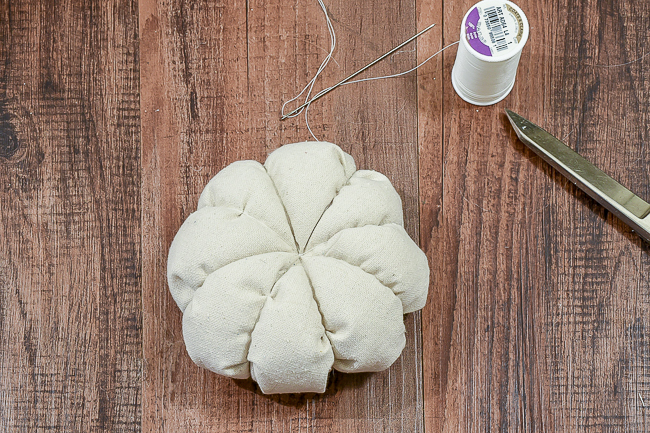 I've got a super easy tutorial that will show you how to make fabric pumpkins in just a few easy steps. I love that there are so many options when it comes to creating these adorable little fabric pumpkins. 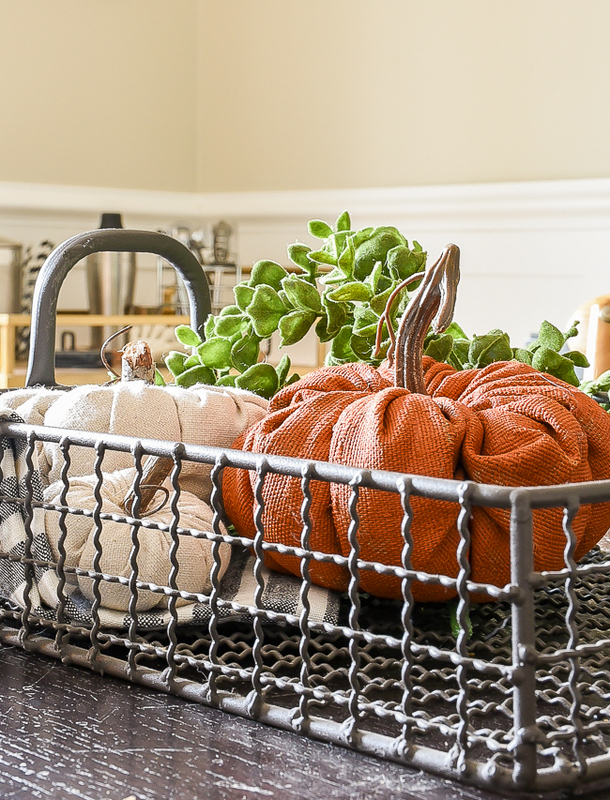 From different fabrics to embellishments, they can make the perfect fall addition for any style of decor. 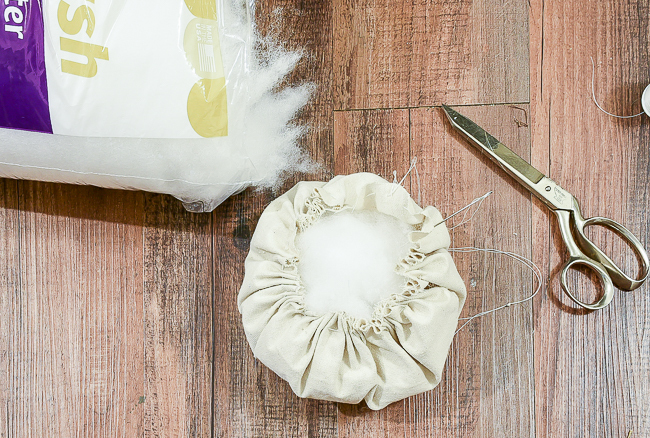 I've been on a purging binge lately, so I decided to use up some fabric I had laying around my house. 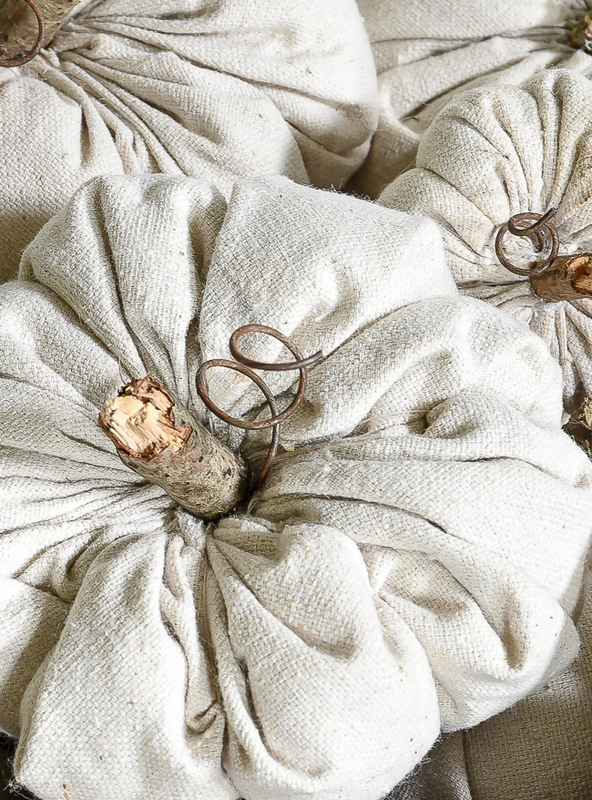 One was a neutral duck cloth and the other was a darker neutral upholstery fabric. Both were given to me for free, which saved me from spending money on fabric. I grabbed the same metal lid I used for the last fabric pumpkins, but I also made two smaller size pumpkins as well. 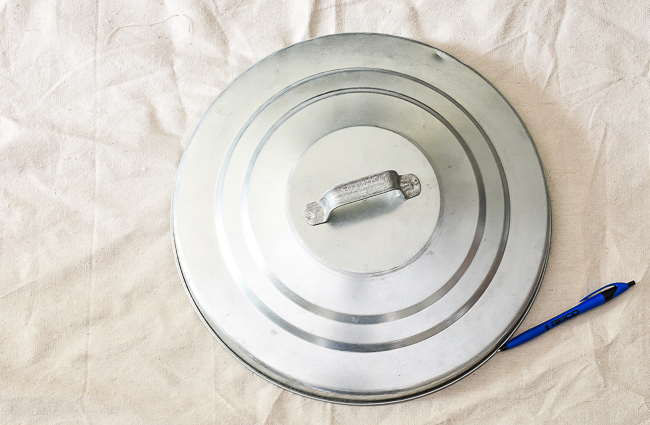 I simply traced around the lid then cut out the circles using fabric scissors. After I had all my fabric cut I started sewing up the pumpkins. Using a 4" long upholstery needle I roughly stitched around the edge of the fabric, about a 1/2 inch from the edge. I doubled up on my thread even though I was using thick nylon upholstery thread. 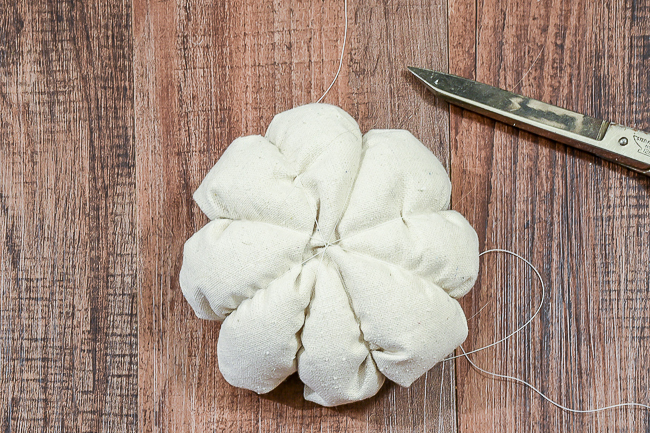 You'll put a lot of pressure on the thread when pulling the pumpkin tight and you don't want to risk the thread breaking. 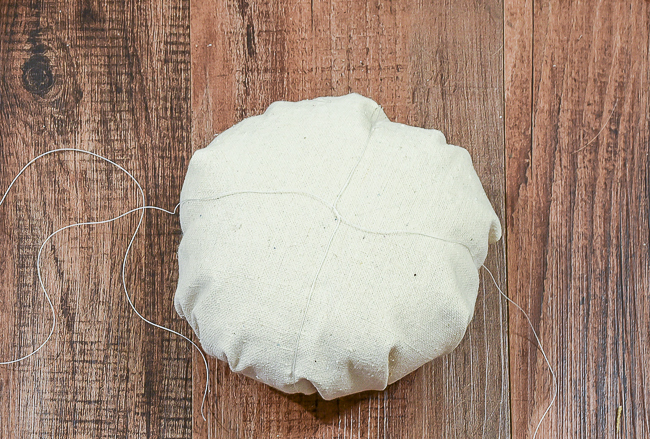 Once I stitched all the way around the circle, I pulled it together, stuffed it with poly-fil then pulled as tight as I could before knotting off the ends and tucking in the raw edges. 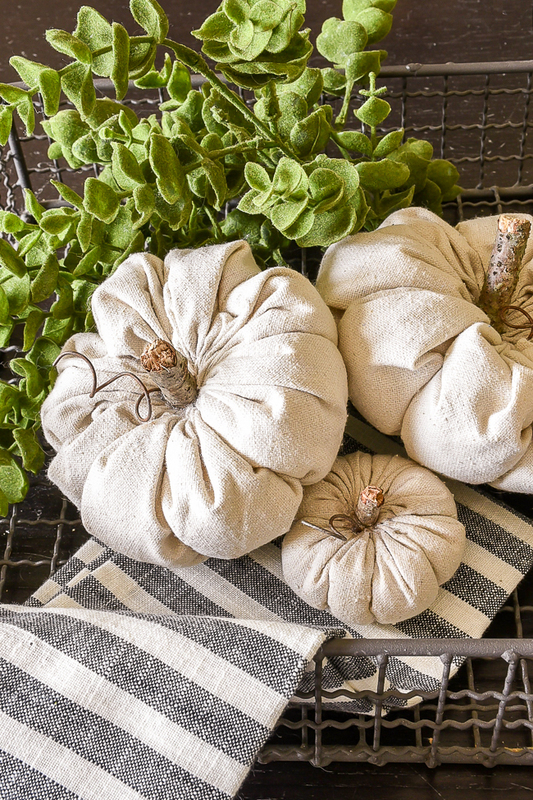 You can always stop here, but I wanted a more textured and authentic look to my fabric pumpkins. I took the same thread and wrapped it around each pumpkin a few times dividing it into sections. To give the fabric pumpkins a more finished look, I threaded the needle through the top of each pumpkin so it came out at the bottom where the threads intersect. I stitched over the intersecting threads and back up through the pumpkin, pulled tight then repeated the same process a few times. 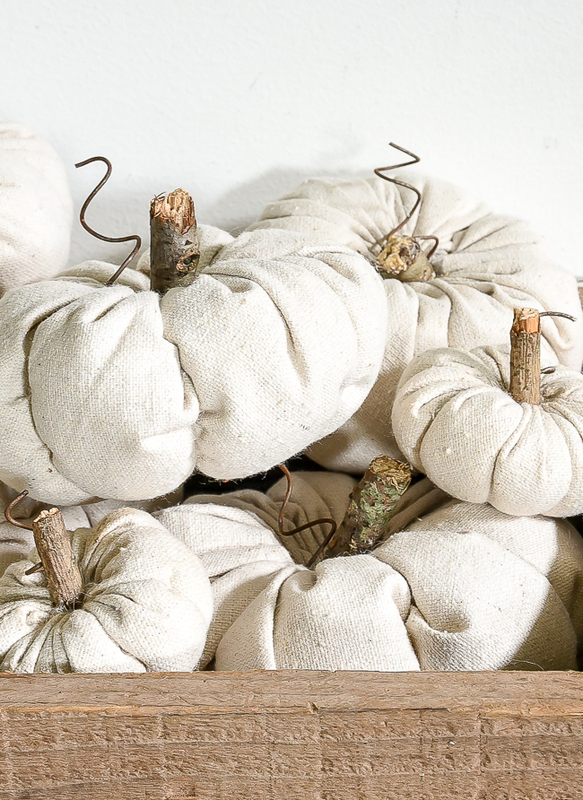 I finished off the pumpkins by hot gluing on a piece of stick and twisted rusty wire. 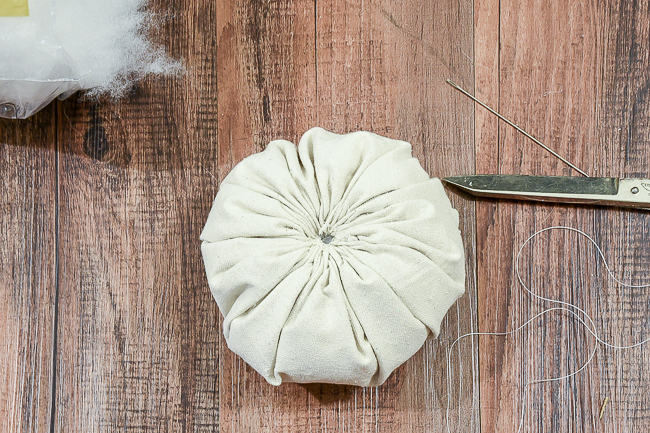 I found out a long time ago that naturally wrapped craft wire is perfectly rusty if you remove the outer layer. 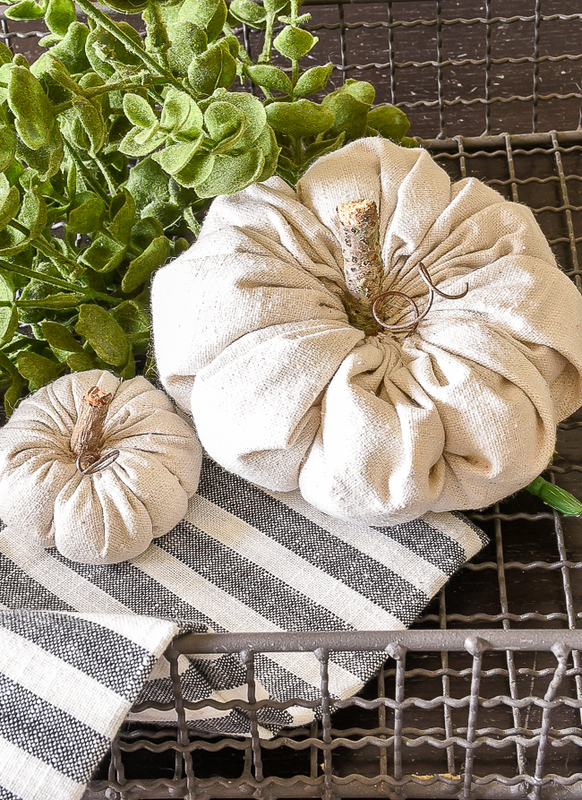 I've used it in many projects and it makes for the perfect embellishment for these adorable fabric pumpkins. 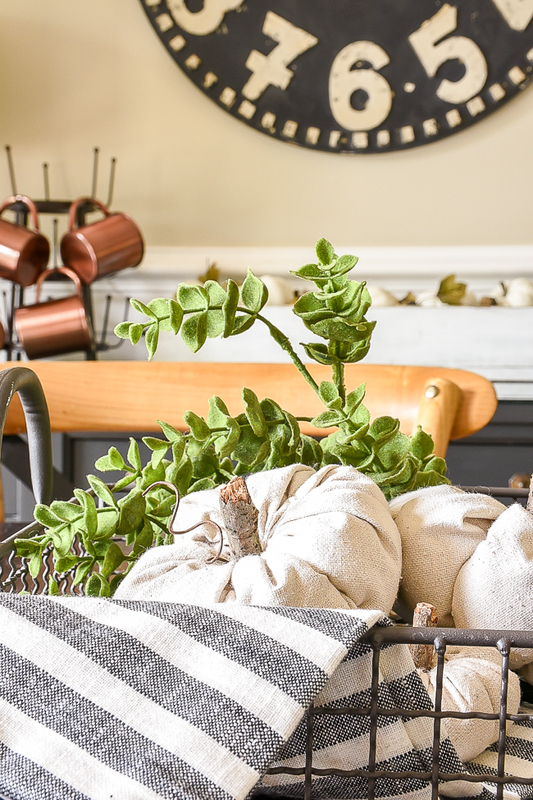 Since I know not everyone is into neutral fall decor, I made another version of pumpkins using a thicker, darker upholstery fabric. I roughly painted them with orange craft paint then finished them off with a stem from an inexpensive Target Dollar Spot pumpkin. 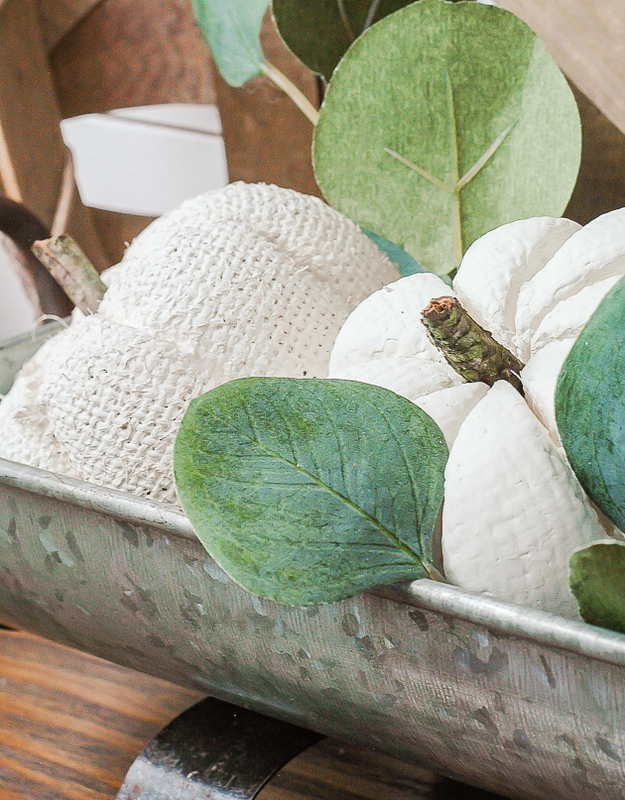 I like to keep my pumpkins simple, but you can always dress them up even more with fabric, felt or paper leaves or other fun embellishments. The possibilities are endless!